Plants terrestrial, bright green to deep green or purple, thallus unlobed, few-stratose except for a rather well-defined midrib, branching dichotomous and occasionally latero-ventral, without strong internal cell differentiation or else with two well-defined central strands of narrow conducting cells, underside without scales, without Nostoc colonies. Specialized asexual reproduction absent. Sexual condition dioecious, gametangia dorsal on main thallus segments, antheridia subtended by small unistratose scales; archegonia clustered, each cluster surrounded by a ring of partially fused scales forming an involucre. Sporophyte protected by a long, cylindrical pseudoperianth with a contracted mouth. Capsule ellipsoidal, valvate, without fixed elaters. Spores unicellular when shed, their walls rather thin and delicate. Genera 2 (1 in the flora): North America, Eurasia. Plants 10--40 x 4--10 mm, translucent green to light, yellowish or deep green, old portions of thalli and perichaetial apices brownish; mostly furcately branched. Thallus plane, margins plane to undulate, entire to crispate, median vascular strands present or absent, best visible in cross section. Rhizoids golden brown to brown, purplish, or colorless, distributed along ventral surface of costa. Thallus with 1-stratose wings 10--30 cells wide, or wider but 1-stratose up to well defined costa, margin plane to crispate. Laminar cells thin-walled, near margin 25--70 x 25--40 \um, polygonal. Oil-bodies in marginal part of lamina mostly 5--50 per cell, spherical to shortly ellipsoidal, almost smooth to loosely botryoidal. Slime hairs of 1--12 cylindrical cells, brownish basally or colorless, sometimes bifurcate or terminating in a colorless clavate slime papilla. Androecium a continuous band of erect to squarrose scale-like edentate to dentate lamellae, each usually with 1 antheridium in its axil. Gynoecia formed on dorsal side of costa, outer involucre of quadrate to cuneate or irregular, entire or ciliate scales (bractlets); inner involucre (pseudoperianth) ellipsoidal-cylindric or tubular, 4--8 mm high, dentate or ciliate-laciniate at mouth. Capsule 2(--4)-valved, (2--)4--6-stratose. SELECTED REFERENCE Crandall-Stotler B. J. and R. E. Stotler. 2007. On the identity of Moerckia hibernica (Hook.) Gottsche (Moerckiaceae fam. nov., Marchantiophyta). Nova Hedwigia. 131: 41--59. 1. 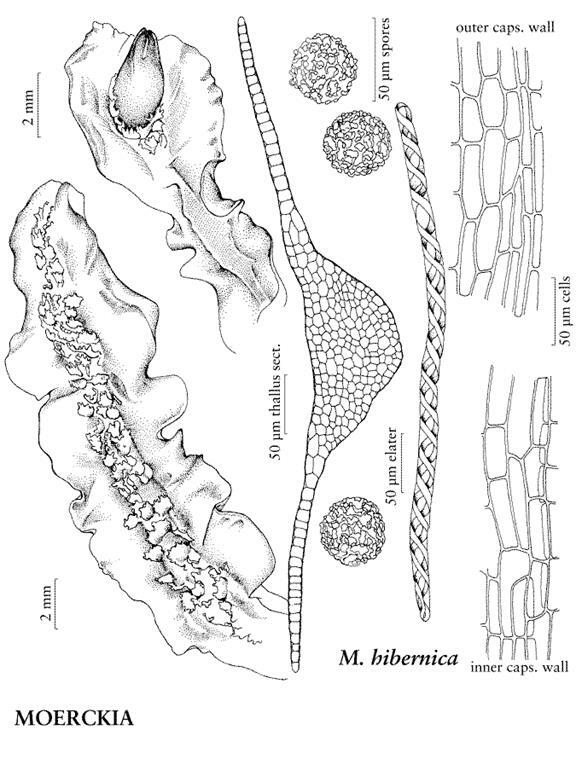 Rhizoids colorless, antheridial scales dentate, not present in sterile plants; thallus margin plane or crispate; conducting stands present or absent … 2. Plants 10--30 x 4--9 mm. Thallus margins frequently distinctly and coarsely undulate to undulate-crispate, costa moderately well-defined, ventrally convex, and gradually thinning to the 1-stratose wings, without visible median vascular strands. Rhizoids golden-brown to brown. Thallus with 1-stratose wings 10--16 cells wide, laminar cells thin-walled, near margin 28--70 x 25--35 \um, polygonal, cells slightly elongated along margin. Oil-bodies in marginal part of lamina (2--) 5--10(--12) per cell, spherical to shortly ellipsoidal, almost smooth to loosely botryoidal; slime hairs formed of 1--2(--3) cylindrical cells, brownish basally, terminating in a colorless clavate slime papilla. Androecia with entire antheridial scales, similar scale like structures (without antheridia) frequently formed on sterile and female thalli. Gynoecia with bractlets entire; inner involucre (pseudoperianth) tubular, 5--8 mm high, ciliate-laciniate at mouth. Seta 10--20 mm. Capsule ovoid-cylindric, wall 4--5-stratose. Elaters ca. 7 \um wide. Spores 30--42 \um, not areolate. Fine-grained soil in wet snow-bed habitats, on peat in oligotrophic bogs, commonly areas with oceanic climate; low or occasionally moderate elevations; Greenland; Alta., B.C., Nfld. and Labr. (Nfld. ); Alaska, Wash.; n Eurasia. Plants 15--35 x 3--5 mm. Thallus with costa well-defined, ventrally convex, more or less abruptly thinning to 1-stratose lamina, in cross section obovate, without visible vascular strands. Rhizoids colorless. Thallus margin entire and plane. Thallus lamina cells thin-walled, near margin 25--45 x 25--40 \um, polygonal, subisodiametrical to elongate; surface of thallus smooth outside area with androecia or gynoecia. Oil-bodies in marginal part of lamina minute and numerous, 18--50 per cell, virtually smooth. Androecia with antheridial scales, similar scale-like structures (without antheridia) never formed on sterile and female thalli. Gynoecia with bractlets deeply laciniate; inner involucre (pseudoperianth) ellipsoidal-cylindrical, 4--7 mm high, dentate at mouth. Seta ca. 40 mm. Capsule oblong-elliptic, reddish brown, up to 2.5 mm, wall mostly 2-stratose. Spores 30--42 \um, not areolate. Elaters ca. 8--10 \um wide. In basic bogs developed over calcareous glacial deposits, growing among and over mosses; low to moderate elevations; Alta., B.C., Nfld. and Labr. (Nfld. ), Ont., Alaska, Maine, Mass., Mich., Minn., N.Y.; n Eurasia. Plants 15--35 mm x 3--5 mm. Thallus with costa well defined, ventrally convex, more or less gradually thinning to 1-stratose lamina, in cross section obtrapezoidal, conducting strands visible (bust sometimes poorly defined) in cross section. Rhizoids colorless. Thallus margin plane to crispate and undulate. Thallus lamina cells thin-walled, near margin 25--45 x 25--40 \um, polygonal, subisodiametrical to elongate; surface of thallus smooth outside area with androecia or gynoecia. Oil-bodies in marginal part of lamina minute and numerous, 18--50 per cell, virtually smooth. Androecia with antheridial scales; similar scale-like structures (without antheridia) never formed on sterile and female thalli. Gynoecia with bractlets deeply laciniate; inner involucre (pseudoperianth) ellipsoidal-cylindrical, 4--7 mm high, dentate at mouth. Seta 40 mm. Capsule oblong-elliptic, reddish brown, to 2.5 mm, wall mostly 3--4-stratose. Spores 40--50 \um, not areolate. Elaters ca. 7 \um wide. Wet slopes over calcareous substrates along streams, more rarely in springy oligotrophic bogs; low to moderate elevations; Alta., Nfld. and Labr. (Nfld. ), N.S., Nunavut, Ont., Que. ; Alaska, Conn., Maine, Mass., Mich., Nebr., N.H., N.Y., Pa., Wash., Wis.; Europe.